Back here I posted this photo of the blanket on Nancy’s bed at the nursing home and speculated on the weave structure. I thought I’d try it out as part of my development in the final project. Then I read this post by Noreen Crone-Findlay on her blog Tottie Talks Crafts. 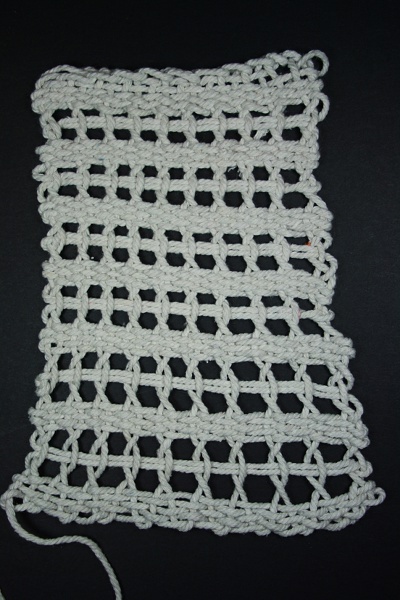 She has a super-fast way of putting on a short warp using s-hooks and has some detailed video tutorials, including doing leno (look around at her posts before and after the June one in the link above, as there is a series). Brilliant! I don’t have that particular kind of loom but the same ideas could be used on almost any, I should think. 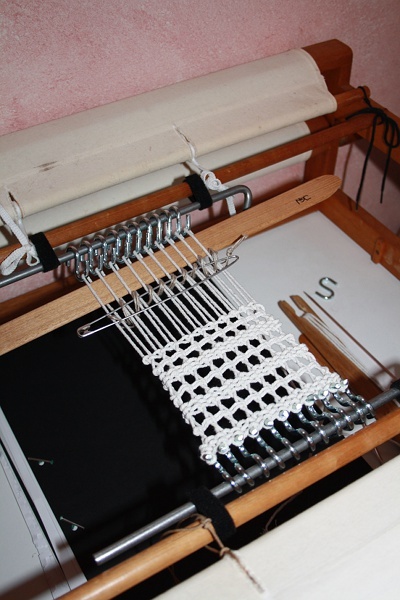 I decided to try with my Robinson loom, seen here in a photo from February 2010 when I was working on Cacophony. The castle (the high structure that holds the shafts with levers to raise and lower warp ends) can easily be removed, as can the beater, leaving the basic frame with a mechanism for adjusting tension. Here is the same loom, castle and beater removed, and leno warped and in progress using Noreen’s method. The closeup shows that as well as my shed stick I used a string and pin setup to keep the second shed. This is another idea from Noreen (here), using a knitting stitch saver instead of a kilt pin. I’ve attempted a slightly different version of continuous string heddles on a stick when playing with backstrap weaving, following instructions by Laverne Waddington (blog backstrapweaving.wordpress.com), but this slightly different form worked well here. 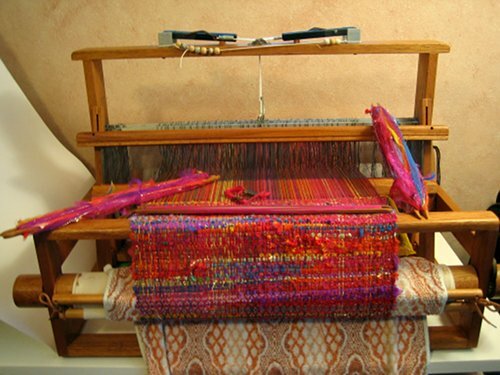 One of the beauties of Noreen’s warping method is that most of it could be improvised using stuff around the home or at the nearest hardware store – for example I used tent pegs for the metal bar supporting the s-hooks (the apron rod was too thick to use the hooks directly on it). Life is easier with a tensioning system, but Archie Brennan’s diagrams show how to manage that with copper pipe and a threaded rod (see his page http://brennan-maffei.com/Loom.htm and scroll down to the “small copper loom” diagram). In a very short time this afternoon I had this little sample done. I chose a large, coarse string, thinking of the rough and impersonal treatment Nancy has experienced (not the nursing home particularly – the whole situation and sequence of events). It’s actually a single continuous piece of string, used for both warp and weft. There are various tension problems, but that seems to fit with the theme pretty well! I think I’ve got the structure right. 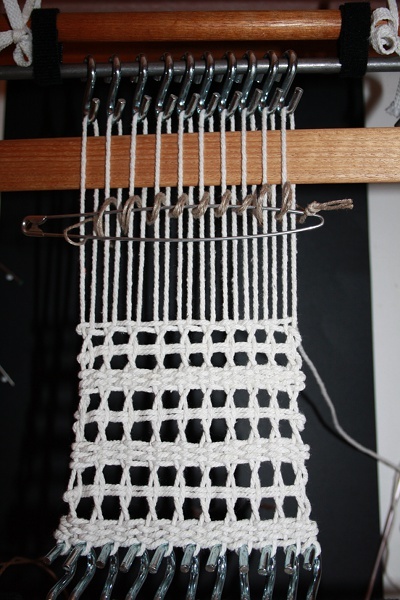 I’m really excited about the fast sampling this method offers, especially with a weaving project coming up in the OCA course. I think that’s tapestry and experimentation focused, so this could fit. 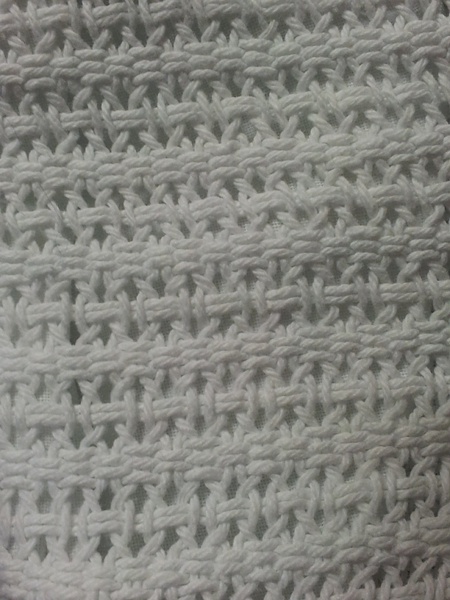 Imagine unhooking a few areas of warp and doing some braiding, or crossing warp ends over to create diagonal elements. Possibilities!!! 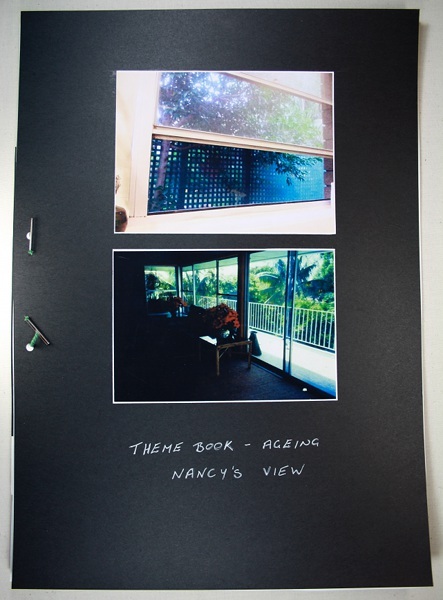 I’m continuing to build my theme book on Ageing. A subset of it is on a page of the blog, but the main book is physical. As was apparent from my earlier posts here and here, I’ve been quite nervous about some potentially controversial or distressing aspects of my theme. I thought I might touch raw nerves, or get caught in a political / ideological debate. I didn’t expect, and very much value, the thoughtful comments and personal stories that people have shared with me in comments and emails. Today I added some material to the separate page – standard disclaimer, please don’t click through if my exploration of the theme Ageing could cause distress or offence: some dark humour about good intentions that missed; some photos of Nancy’s view; and a brief version of Nancy’s story, her journey from home to nursing home, in which I finally use the words I think might be a trigger. The comments I’ve received have challenged me, helped and/or forced me to think more deeply about this theme. I would be very interested to read more and to understand different views. If you want to read the theme page from the top, click here. After a brief email discussion with my tutor I have decided to go ahead exploring the theme of Ageing. I first introduced it in this post. I appreciate the comments that people left sharing their experiences, but I’m very aware that this is basically a textile blog and the material I might get into with this theme could potentially distress or confront readers on a personal level. I’ve decided to put most future information I choose to share on a separate page of the blog, here. In a post I might refer to theme work in a general way, but readers will be able to choose whether to click through to the detail. 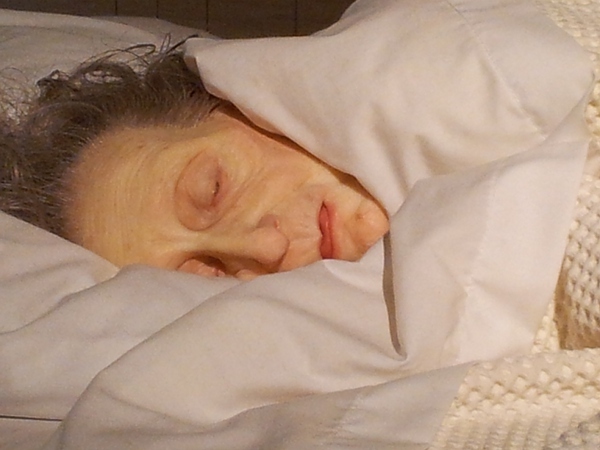 The photo shows the blanket on Nancy’s bed at the nursing home. I’ve spent some time looking at the weave structure – leno, with areas of plain and almost basket (?) weave. 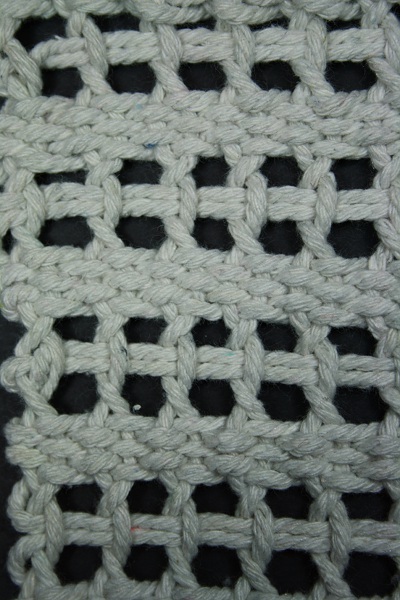 I think I could weave it, but would have to use doups rather than bead leno, since that doubles up warp ends. I’ve commented a bit further on the separate theme page – please don’t click through if my exploration of the theme Ageing could cause distress or offence. If you wish to read more click here. For a while now I’ve been thinking about ageing or memory as a potential theme for my design project for A Creative Approach, and basically because of an emotional connection I am being drawn towards Ageing. 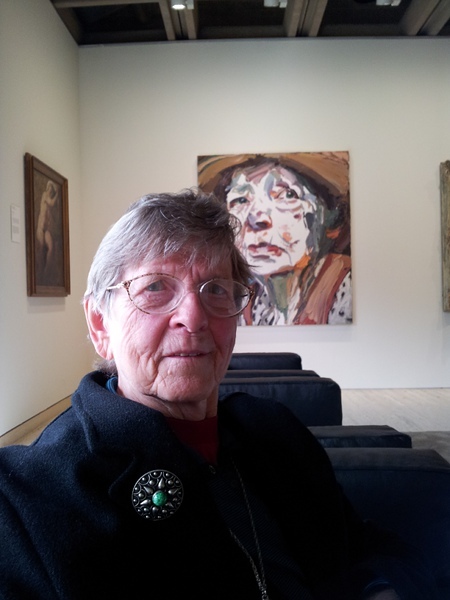 This is my mother at the Art Gallery last weekend. I’m not really thinking of her stage of ageing. Mum’s in her eighties, is careful of what she eats, makes sure there’s a Physical, Mental and Social element in every day, is aware of and preparing for what may be in the future but is fiercely making the most of every moment. She has led and continues to lead an adventurous and independent life and I am enormously proud of her and her achievements. When this photo was taken we had just finished recording the first installment of the Oral History she wants to make, starting at age 11, sitting in a chapel in Weymouth when a man came in with a note for the preacher – England was at war. In the background is Ben Quilty’s portrait of Margaret Olley, another fierce and independent woman. 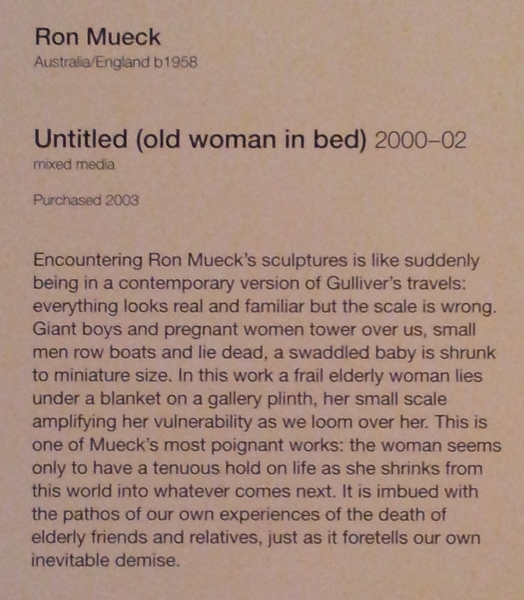 Earlier that day we came across a work by Ron Mueck. It totally stopped me in my tracks. I’ve included the information plaque because I think it describes the work beautifully. 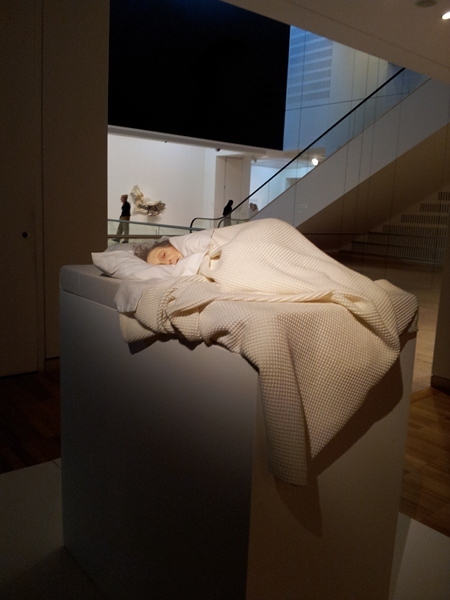 This is an amazing, hyper-realistic work, perhaps two-thirds life size and looking even smaller in the large gallery space. The sense of vulnerability and frailty is one part of what is concerning me. This is the photo that really bothers me. 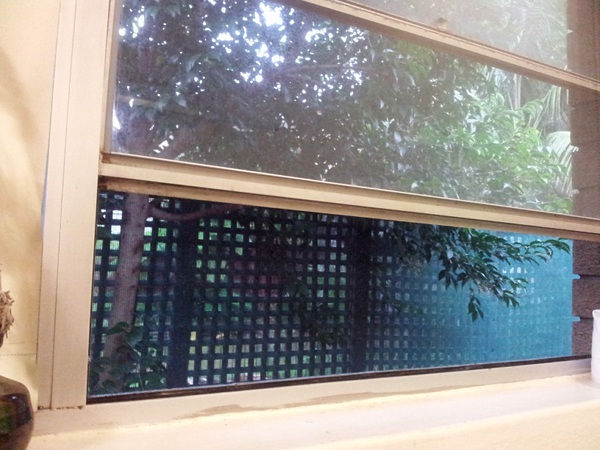 It’s the window of a shared room in a nursing home, the home for over two years of a woman I know and occasionally visit. She is frail, vulnerable, alert, intelligent, trapped, scared, in pain. She used to be proud and independent in a quiet but determined way. Widowed as a young woman, she has raised her children alone. Now she is in a system that in the name of protecting her has stripped her of almost everything. Virtually everyone involved – family, nursing home staff, bureaucrats, whoever – will say in honesty that they are doing their best to care for her but the result is horrendous. She loves that window, the light, the view. She loves her family too, but she is ready to go. I don’t know whether Nancy will be my focus (that’s not her real name, but obviously I’ll do my best not to identify her, her relatives or the nursing home). It’s more around loss of choice and personal control, physical restriction – for example see this article (I’m right to go, just don’t wake me by Mark Metherell accessed May 11, 2012) about people who have “Do Not Resuscitate” tattooed on their chest. I’m not sure how much I will blog about this, as it could be regarded as political and divisive which is not my intention. I’m not sure what my feelings are, beyond anger and pity, and I certainly don’t have any answers just lots of questions. I would like to learn and think more about this, to find a way to express myself in a way that is thought-provoking and not unduly offensive. I guess this is a toe in the water.